Synopsis: Based on the classic Hasbro board game, a small Naval fleet comes across some alien ships in the middle of the Pacific during an international Naval war games exercise. Led by reckless Lieutenant Alex Hopper (Kitsch), the fleet must figure out a way to defeat and escape the invaders despite being cut off from the rest of the U.S. Navy. Andrew: Hello readers! The summer movie season kicked off a couple of weeks ago with the highly anticipated The Avengers, and it didn’t fail to deliver even with the sky-high expectations Sarah and I had placed on it. Well…tonight was a bit different. 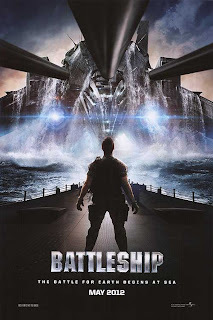 We hit up the local AMC Theatres to catch this week’s major blockbuster, Battleship, and if you read our weekly preview we posted on Thursday, you know we went in to this one with almost no expectations whatsoever. So Sarah, did Battleship exceed the very minimal bar we had set for it, or did it manage to fall short? Sarah: Hmm…I think it hit right about where my expectation level was. It could be that my expectations were so low that that’s where it fell, but it just happened that way. It didn’t blow my mind, but I managed to laugh during it. How about you? Did it hit your expectations? A: Considering how low mine were, I’d have to say that there were moments where the film exceeded them and then other times where it plummeted well below. 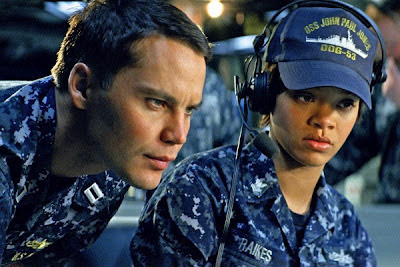 Let’s put it this way – Battleship is not good. It’s just not. It is BIG, it is LOUD and there are lots of explosions that would make Michael Bay proud. But Peter Berg has somehow managed to make Bay’s awful Transformers: Revenge of the Fallen look like Citizen Kane compared to this. S: Ouch! I’m not sure I would agree with you on that. I still think that Transformers: Revenge of the Fallen is awful, and probably not even worth watching to bridge the gap between 1 and 3, but you’re right. This was not a good movie. It made you think at times that it was good – what with all the guns going off and the aliens attacking – but then I started noticing things. For example, the game boards came to life on the big screen. As I’m watching the alien attack I started to notice that their ammunition obviously resembled the plastic pegs from the game. I understand that this movie has not been hiding the fact that it’s based on the board game, but c’mon. That was more comical than anything else in the film and I don’t think it was meant to be comical. A: Well obviously it’s never been hiding the fact it’s based on the board game, but in my opinion, other than some parts of the last act, the alien peg missiles were the only thing that showed me the filmmakers were actually making a movie based on the board game. What? When you played Battleship as a kid, you didn't play as the aliens? A: Yeah, the unintentional comedy factor was quite high for this movie. A lot of terrible one-liners, bad acting, stupid situations and more…it was bad. That said, the opening act of the movie up until the naval ships actually head out to sea for the “naval games” wasn’t half bad! It was intentionally funny and it worked, and I actually kind of got into the story of Kitsch’s (John Carter) Alex Hopper trying to gather up the courage to ask Liam Neeson’s (Taken) Admiral Shane for his blessing to marry his daughter, played by Brooklyn Decker (Just Go With It), who didn’t really do a whole lot. Speaking of Decker not doing a whole lot, one of the biggest negatives of the entire film to me was characters either being miscast or having not much to do with the plot of the film. Neeson and Alexander Skarsgard (True Blood) get short shrift, in my opinion, and one guy who gets too much screen-time is Gregory D. Gadson as Lieutenant Colonel Mick Canales. Gadson’s character is a former soldier who has lost both his legs and his physical trainer is Decker’s character. And it’s not that he’s a bad actor, it’s just that he’s an actual soldier being asked to act and it’s not pretty. S: I actually think that it’s kind of cool that he’s a real soldier, but I agree that he probably shouldn’t have been given that much screen-time. The acting was pretty horrible. I’ve decided that Taylor Kitsch plays Taylor Kitsch pretty well. We’ve seen him in two films already this year and he plays the same character in each of them. I was pretty disappointed in his role. I expected to see Neeson in more than just the beginning and the end. They introduced characters from NASA and Washington, D.C. that really didn’t add much to the story, and it bothered me a little bit that there was no real bad guy! Usually with aliens movies there’s someone who’s trying to profit from the alien invasion and that was missing. I’m not going to lie, for it being such a crappy movie I expected there to be someone in the background pulling some financial political strings. If I’m going to see a bad movie, I prefer them to be predictable. A: See, while you say there wasn’t any antagonist I disagree because obviously the aliens were the bad guys. But what bugged me about them is that WE NEVER FIND OUT WHY THEY CAME. Nowhere do they ever say why exactly the aliens came to Earth, why they’re so violent, and why they hate overpasses so much (you’ll see). There’s one point where we see that it’s not the first time the aliens have done this, but we never understand what their reasoning is. That bugs me. S: Yeah! All they really gave the aliens is that they’re not too keen on sunlight. That’s it. Nothing else. We didn’t even establish if they could communicate with us in any way. Very disappointing. A: Speaking of disappointing, before we wrap this up real quick, I was also disappointed that the movie is based on and called freaking Battleship and yet 99% of the movie has nothing to do with an actual battleship. Instead they’re on Naval Destroyers. Just one of the many things this film missed the mark on, if you ask me. S: And where were all the other ships? Stuck outside the playing field. Yeah, it was a disappointed movie and I’m kind of getting sick of writing negative movie review this week. I’m hoping the next movie we see, What to Expect When You’re Expecting, is funnier if anything, even if it’s not particularly better. I just wish somewhere along the way someone said “Um no, this is not good.” They spent all this money on big name actors and special effects and no one seemed to pay attention to who was writing the damn thing. And they never even said, “You sunk my battleship!” Thanks for ruining a great childhood game for me, Universal and Hasbro. A: And with that, I’d say it’s safe to say our final word on Battleship is to skip it. Don’t waste your time or money on it. Sorry that we may have ruined the movie for you, Anonymous. That certainly wasn't our intention, as we only try to give our thoughts on the films we see. If you have suggestions on what we could improve, we greatly appreciate all comments!